Everyone knows I’m accident prone – if there’s a patch of ice, hole in the ground, low hanging branch, piece of wood with a nail, or exposed wire – count yourself lucky, I’ll find it before it hurts anyone else. I couldn’t produce a list of accidental mishaps to save my life, I wouldn’t know where to begin. Breaking them into categories might be easier – number of times I’ve been hit by a drunk driver , given myself a black eye, slipped on ice, broken toes or fingers running into things, cut myself falling on or breaking glass, mishaps while walking the dog, accidents at work, and my latest category – bee stings. I spotted the bee under my bedroom window – most nights it would have meant scooping up and releasing it outside. I can’t say if it was the heat, glass of wine, state of exhaustion or combination of factors, for whatever reason – last night I stomped on bedroom bee, nary a thought other than vacuuming in the morning. I went to bed without a single bee on my mind. My first thought was nail or tack – still half asleep and headed for the bathroom, making sense of the pain proved difficult. I couldn’t see anything in my foot, back in my bedroom it became clear – carpet bee had waited in ambush at the foot of my bed. A perfectly reasonable circumstance – the one and only time I strayed from capture and release, the bee walked six feet across the floor to the exact spot I stepped out of bed. It’s been decades since a bee sting assault, the pain came in relentless waves, each one more powerful than the last. 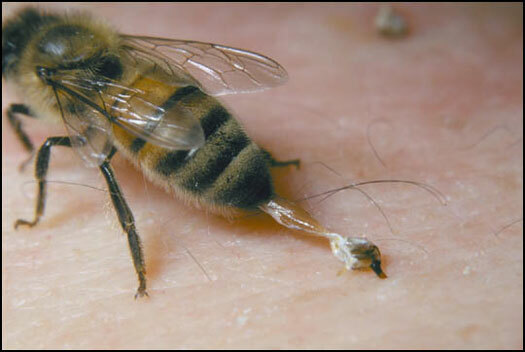 The initial sting hurt, much like a sensation of stepping on something sharp. As the venom spread that changed to a strange throbbing burn, an oddly disquieting pain gaining intensity by the minute. Back in the bathroom, running my foot under cold water helped a little – not enough to muzzle outbursts of agony. Limping back to my room and Goggling first aid remedies was futile. I found a site listing home remedies in order of effectiveness. Number one was applying meat tenderizer – are you kidding me? Next came vinegar and baking soda, ice packs, cortisone cream, and ibuprofen for swelling and pain. I drank a glass of wine.